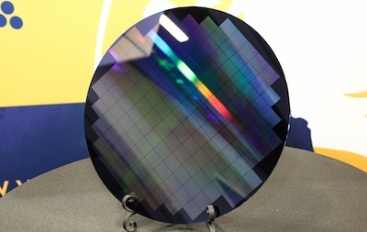 450mm wafers patterned with immersion lithography debut at SEMICON West 2014. 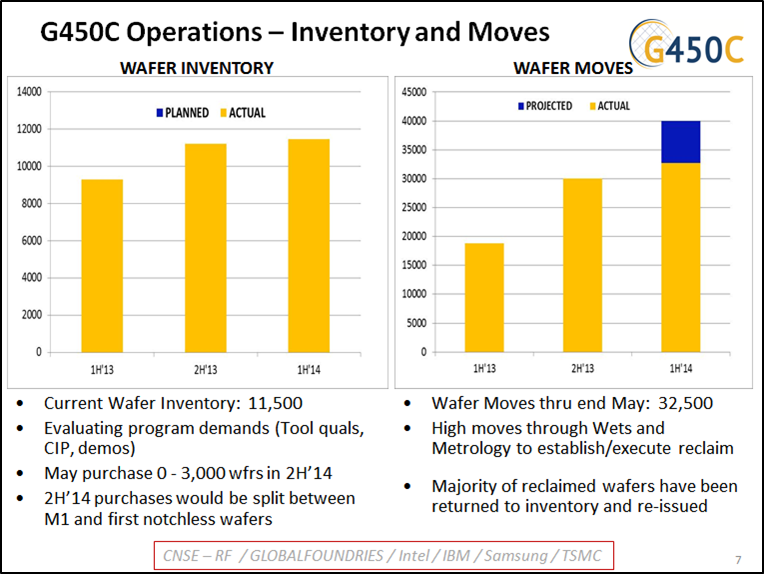 The first fully patterned 450mm wafers were on display at SEMICON West 2014 in South Hall and also showcased in the 450mm Technology Development Session. Fully patterned 450mm wafers produced using Molecular Imprints’ Imprio nanoimprint lithography (NIL) tool have been shown before (including at SEMI ISS meeting in January 2013). However, the 450mm wafers on display at SEMICON West were produced using Nikon’s 193 immersion scanner, making it the first of its kind to use conventional lithography tools currently in use for 300mm wafer production. One of the first fully patterned 450mm wafers produced using conventional 193 immersion lithography. 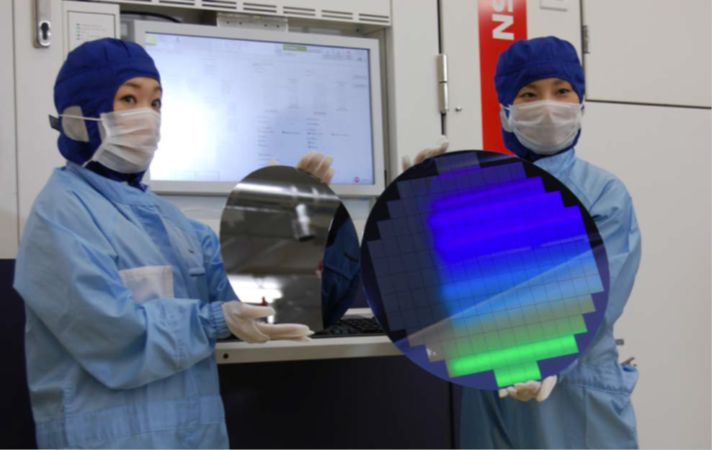 “These first 450mm wafers are tangible proof that the industry’s transition to this next generation technology is on track and gaining momentum,” said Paul Farrar, Jr., VP at SUNY CNSE/SUNYIT and GM of the G450C. 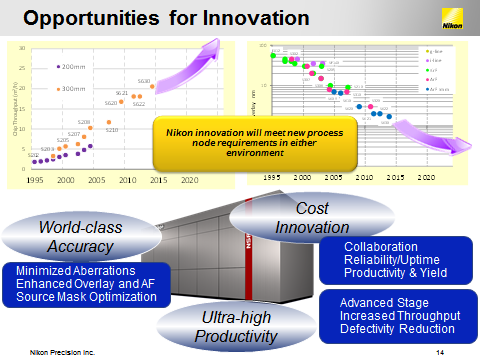 The Nikon immersion scanner will join existing 450mm infrastructure at the Albany NanoTech Complex in April of 2015 in accordance with the project timeline. 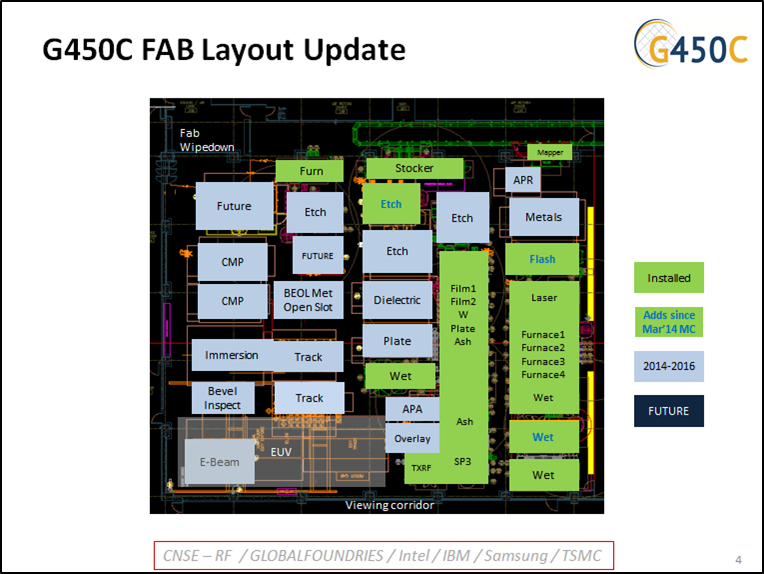 This critical milestone will enable G450C founding members and CNSE to perform 10nm and below, full wafer photolithography, while optimizing tool configuration and performance. 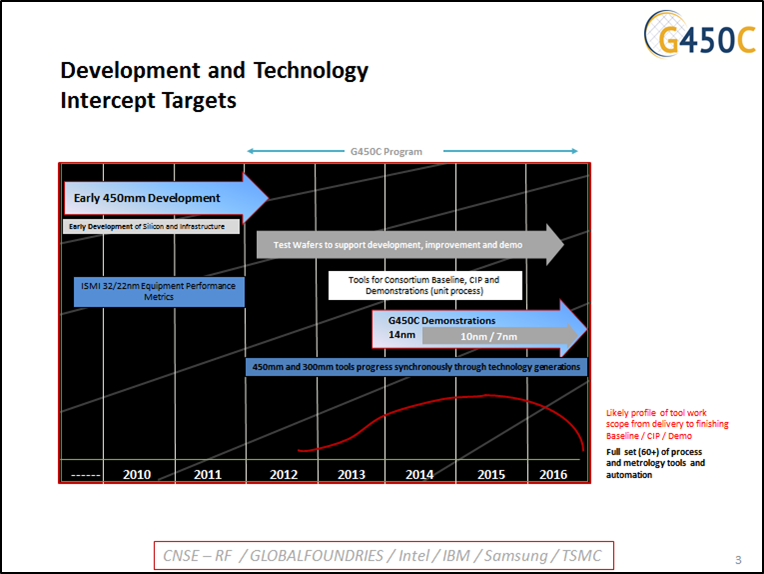 In July 2013, CNSE/SUNYIT and Nikon entered into a $350 million partnership to develop next-generation photolithography technology. In less than 12 months, the partnership brought about a first-of-its-kind immersion lithography scanner online. “Nikon is very pleased to have achieved this key milestone, and we are intent on beginning the next phase of this program, said Nikon Corporation’s Toshikazu Umatate. “450mm scanner development is progressing on target to deliver the performance and productivity innovations that will deliver reduced cost per die, which is essential for the continuation of Moore’s Law.” So far, more than $350 million in 450mm wafer tools have been installed at the Albany NanoTech Complex. With the arrival of the Nikon immersion photolithography tool, the investment will increase to over $700 million. Jonathan Davis, global VP of Advocacy at SEMI, kicked off the 450mm Transition Forum event, and welcomed the presenters — Dan Hutcheson (VLSI Research); Hamid Zarringhalam (Nikon Precision); Paul Farrar, Frank Robertson, and Pinyen Lin (G450C) and the audience. Highlights of the session are presented below. G. Dan Hutcheson, chairman and CEO of VLSI Research, presented next on “450mm and Moore’s Wall.” Hutcheson discussed the tendency to view 450mm and scaling as independent when they are very interconnected. He stated that if growth in transistor consumption continues to stay steady (like it has since 1970) and if the rate of scaling slows then the area of silicon consumed has to increase because “it’s simple math.” He said, if we assume that Moore’s Law extends to a four-year clock cycle, “You’re going to need a lot more silicon.” And you will need to build more fabs. 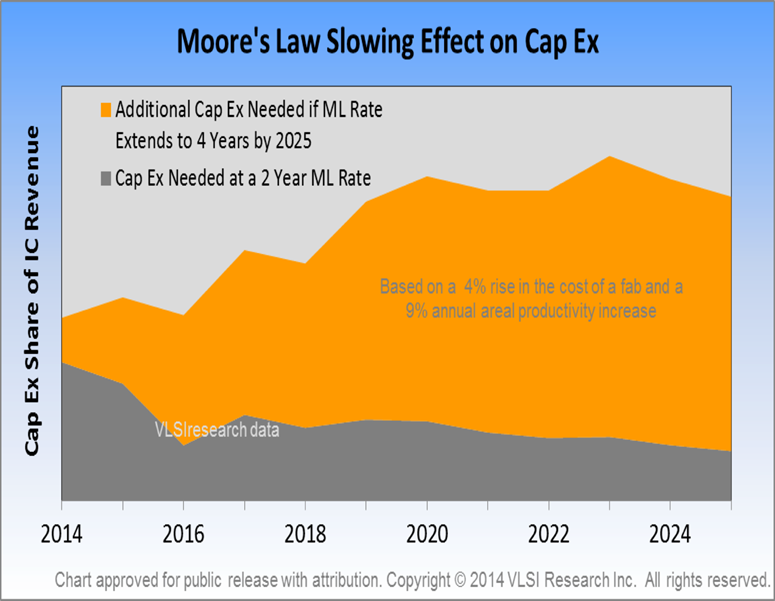 At a two-year Moore’s Clock Rate, 2025 is the 1.4nm node production ramp, but at a four-year rate, CapEx/sales rate will pass 30 percent, and that will quickly become expensive and unsustainable. 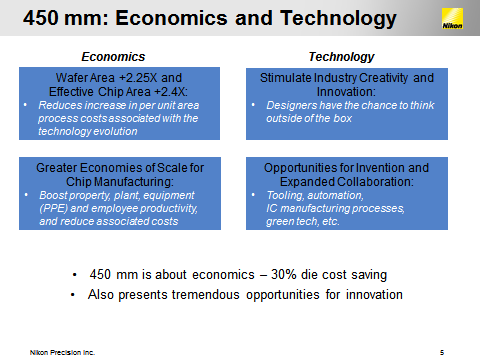 Hutcheson said, “Physics will build Moore’s Law… if economics doesn’t,” and while 450mm is not needed now, it will be needed later to extract profit from the value. Paul Farrar, GM of Global 450 Consortium(G450C) presented on “450mm Technology Development.” Farrar is GM for Industry Interface and Program Strategy at G450C which is based at the College of Nanoscale Science and Engineering in Albany, New York. Farrar said that tool demonstration development is continuing with all suppliers active in the G450C program based at CNSE in Albany, New York. The consortium aims to have a full set of about 60 process and metrology tools by 2016. 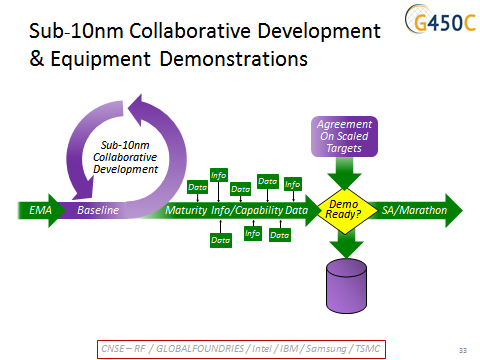 Farrar said that tools are now being developed for sub-10nm technology compared to the 14nm readiness target originally identified at the onset of the program. Farrar reported on the tool installation status, stating that 29 tools requiring station controllers (tMSP) are on the G450C floor. He also reported on 450mm wafer inventories and data on thin film application equipment performance. G450C has an inventory of 11,500 wafers for tool development and qualifications. 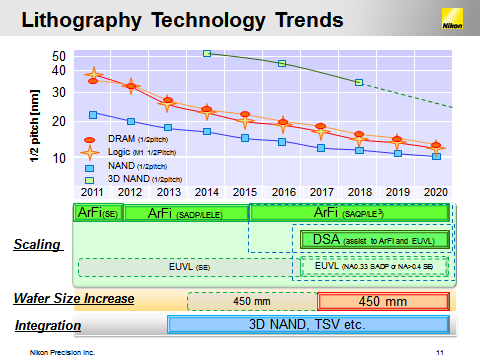 Hamid Zarringhalam, EVP, Nikon Precision, presented on advanced lithography development stating that motivations for next wafer size transition exist — with the economics and opportunity for innovation. He argued that the “450 Motivation” is about economics with a 30 percent die cost savings, with much opportunity for innovation. He talked about the lessons learned at 300mm: Industry focus and management are required for successful transition; R&D investment must be optimized and shared across the chain; avoid false starts experienced with 300mm; align on industry timing is imperative. Zarringhalam expects 450mm development cost to be about $14 billion with payback occuring over an extended period of time. He referenced the example of the Boeing Dreamliner 787 aircraft, which is expected to take 22 years to fully recover the development costs. Zarringhalam stated that an assumed industry growth rate of 3.8 percent, the 450mm wafer transition in the semiconductor industry is analagous to the Boeing aircraft scenario. Therefore, he contends that industry must take a long-term view. He emphasized that consensus and commitment for HVM start are paramount – should be done “soon” to intercept “latter part of the decade” intact. He feels that effective management is essential in balancing risk and reward and that collaboration — and G450C — are essential. According to Zarringhalam, Nikon innovations in immersion extension will meet litho process requirements regardless of wafer size. While some say that the benefit from 450mm lithography is limited, Nikon believes that there are vast opportunities for innovation. The Nikon 450mm program is progressing on schedule. Customer orders are in place and several tools are undergoing manufacturing at the factory. 450mm litho patterned wafers are already here – and patterning 450mm wafers for G450C from Nikon Kumagaya facility is started as scheduled. The Nikon 450mm immersion scanner will ship to Albany on time in April 2015. Frank Robertson, VP and GM at G450C, reported on program equipment performance metric revisions and 450mm tool demonstration milestones. He highlighted industry-wide coordination, collaborations and standardization efforts such as the information sharing with the European 450mm Equipment & Materials Initiative (EEMI450) program, discussions on CMP slurry recycling with Silicon Saxony companies, ongoing EHS / facilities coordination with the Facilities 450 Consortium (F450C) and work on development of various SEMI 450mm Standards. Pinyen Lin, Ph.D., director of Etch Engineering at G450C, also presented at the 450mm Technology Development session. He is leading an industry-wide team to drive the standardization of notchless wafers and design the orientation fiducial marks. Lin reviewed 450 notchless wafer progress, starting with tool suppliers requesting evaluation of notchless wafers in November 2012 and SEMI members expressing many notch-related problems: stress, non-symmetry, non-uniformity, complicated tool parts, and edge exclusion. A Work Group was established and the schedule was defined at G450C in February 2013. Phase 2 test results (November 2013 to February 2014) included: 9 fiducial marks on 3 different test wafers; Verifying the fiducial design concepts to fit all tool requirements (e.g. litho, metrology, handling, and processing tools); and Selecting the final 3 fiducial marks based on test results. The final set of Orientation Fiducial Marks was selected in March 2014. Ballot for cycle 4 was approved at SEMI North America meeting in April 2014 with ballot receiving 100 percent acceptance and Committee approval; M1 standards are expected to pass at SEMICON Europe. For more information on 450mm, visit 450 Central.